To choose the right Ultrabatch for your application you can search though all the Ultrabatches in our pricelist. See below for our guide to Ultrabatch codes. Depending on your needs you can narrow your search and obtain the desired informations on specific Ultrabatches (CAS no., migration, stabilities etc). Add desired colour, color index, carrier and/or Ultrabatch no. to the top four drop down boxes and press search. In addition to the top four boxes you can also make your selection from specific properties of the Ultrabatches. In the 3 boxes below heat, light and weather stability can be specified. When selecting a stability your output will be the selection and all Ultrabatches that has better properties than the selection. This makes it possible for you to find pigments that can endure your demands. If you need the Ultrabatch or final product to be suitable for food contact applications and or live up to the American FDA, simply press yes in the small check boxes. After checking all your demands press search, and you will see which Ultrabatches are suitable for you. If you need to narrow your search even more press advanced search. More possibilies occur, e.g. Lead, diarylid and many others. When making an advanced search the results will open in a new window. It is up to you which selections you wish to see on the advanced search result page. Simply check the boxes you need information about and press search. On both search result pages you will see a small i. Press the small , and most properties for the product will occur on a Product information sheet. Please note that information on this page are only guidelines and you will need to address Kunststof-Kemi for a valid copy. Most information regarding stabilities etc. are obtained from our pigment suppliers and Kunststof-Kemi will not take responsibility for problems relating to that. A small (s), next to the test method indicates that we have acquired the information from our pigment supplier. Heat (s): The heat resistance of an Ultrabatch is evaluated in Full Tone (FT) and Tint (T). The evaluation is made in accordance with EN 12877-2 using Gray scale assessment (1-5). Light (s): The light resistance of the pigment is evaluated in Full tone and Tint in accordance with ISO R879/DIN 53387. The samples are exposed to filtered xenon light for up to 1000 hours and assessed against Blue Wool Scale (1-8). Weather (s): Weather resistance is determined in Weather-O-meter and the color change is assessed against ISO Gray scale (1-5). Warping (s): The term warping gives an expression of the pigments tendency to alter the crystallization kinetics on polyolefins. The degree of warping is denoted as +/- and high where there is a significant influence on the polyolefins. Lead: The Ultrabatch is lead based (e.g. 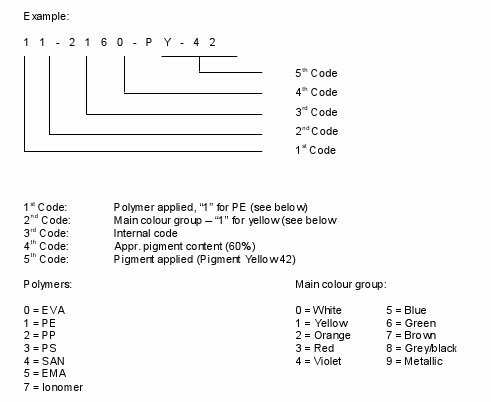 lead chromate pigments, PY-34 and PR-104). Use of these pigments are limited due to toxicity.